Bermuda Heroes Weekend (BHW) will host its first annual launch with a band preview for 2016, performance by a soca artist and black-tie gala. 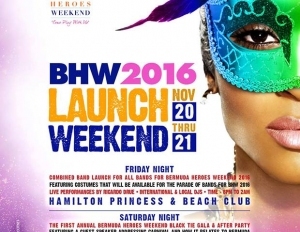 Hamilton, Bermuda, November 2, 2015 –Bermuda Heroes Weekend (BHW) will host its first annual launch with a band preview for 2016, performance by a soca artist and black-tie gala. The launch weekend will be held on November 20 and 21 at the Hamilton Princess & Beach Club in the Harbourview Ballroom and will feature costumes for 2016 including new bands, announcement of Band of the Year 2015, a performance by Ricardo Drue and much more. November 20 will see the presentation of costumes for each of the nine bands participating in Parade of Bands 2016. These bands include returning bands Party People, Passion Bermuda, RealFrenz and Caribbean Massive and new bands Nova Mas International, Code Red, Intense, X-Plosiv and Band Addiction. Guests will be given the opportunity to view the actual costumes for Parade of Bands 2016 as they will showcased by models. Each band will also have a booth where guests can obtain more information. In addition, soca artist Ricardo Drue will perform his hits including “Vagabond” and “Professional”. DJ’s Barrie Hype and DJ Stephen will return to the Island for the party and will be joined by Titan VCD and DJ Coolie. Doors open at 8pm and as the launch will start at 9:00pm, patrons are encouraged to be on time. November 21 will allow guests to learn a bit more about Bermuda’s ties to the Caribbean and the history of Carnival. The black time gala is titled "Our Time - Celebrating Unity, Rhythm & Culture" and will feature historian Corey Butterfield as guest speaker for the evening. The night will begin at 6pm with cocktails in the Trudeau Room featuring steel pan entertainment. A four-course Caribbean inspired dinner will follow in the Harbourview Ballroom at 7pm. Guests will be entertained by DJs Barrie Hype, DJ Stephen and Titan VCD, along with additional entertainment. The winner of Band of the Year will also be announced at the gala and an after party will be held from 9pm to 1am once the gala has concluded. Tickets for the launch party on November 20 are $40 on ptix.bm. The black tie gala tickets are $150 per ticket. Guests can buy a combo ticket for $175 which includes admission into the launch party and the gala. Sponsor tables are available for $2,500 for a table of 10. These are available by emailing vbuckley@bermudaheroesweekend.com. For more information, please visit www.bermudaheroesweekend.com or visit the Facebook page. About Bermuda Heroes Weekend Ltd. The Bermuda Heroes Weekend is a series of events organised by the BHW Ltd., a team who is dedicated to providing unique cultural experiences and quality entertainment. The BHW Ltd. team members are not only avid carnival-goers but, collectively, have over 15 years experience producing successful events and have gained the respect of some of the top celebrities in the world of soca music. The committee includes President Jason Sukdeo, Nalton Brangman, Jumaane Davis and Akbar Lightbourne.